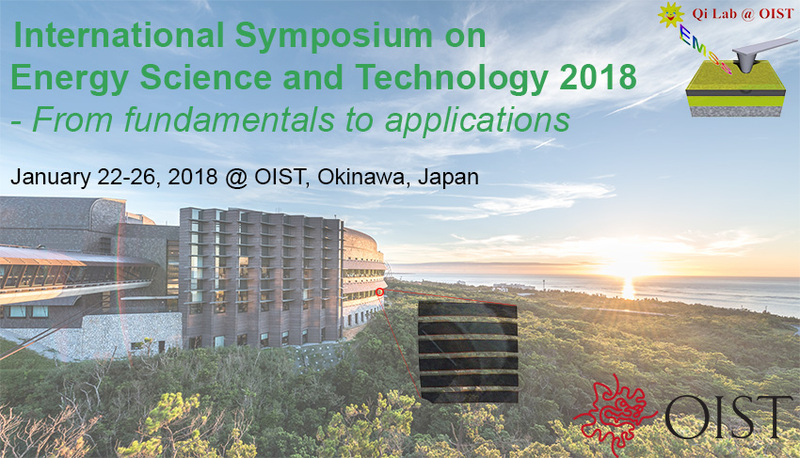 Please address questions and inquiries to isest2018@oist.jp. The aim of this symposium is to gather scientists and engineers to report and discuss the latest progress in energy science and technology as well as future energy research directions in Asia and Worldwide. Information exchange and research collaboration will be promoted through stimulating results and engaging discussion, discussion panels, video poster sessions, and mixer events of symposium participants and OIST graduate students, and other flexible interactions. The symposium will focus on energy science and technology such as integrated energy harvesting and storage systems, energy-efficient LED/OLED lighting, rational design and synthesis of energy materials, organic-inorganic hybrid materials for energy harvesting, Lithium ion batteries, etc. Despite the recent advances and development of novel materials for energy harvesting, electricity storage, and energy-efficient light emitting devices, there is still plenty of room for further improvements. In particular, the developments of protocols to make these technologies amenable to industrial scale is of paramount importance (e.g., building-integrated photovoltaics). It is necessary to establish solid understanding in the areas such as robust material synthesis processes with minimum batch-to-batch variation, know-how of large area energy harvesting/storage modules for commercialization to take off, strategies ensure environment friendliness, remedies to minimize energy material degradation during operation, encapsulation and coating technologies, energy materials with enhanced energy density storage capabilities suitable for hybrid electric vehicles, film growth for energy-saving light emitting novel materials (Nobel laureate Prof. Shuji Nakamura replied indicating his interest in attending ISEST 2018). Detailed factual cost analysis in evaluating various fabrication processes taking into account cost-effectiveness in a mass production scenario. In parallel, equal efforts are needed to address the fundamental aspects of novel materials aiming high-efficiency, long-lasting devices by rational design. Various types of new generation solar cells, e.g. dye-sensitized solar cells, amorphous-Si solar cells, multicrystalline-Si solar cells, copper indium gallium selenide solar cells, copper zinc tin sulfide solar cells.